Vulnerability Management (VM) means systematically finding and eliminating network vulnerabilities. Choosing a solution for VM is a critical step toward protecting your organization's network and data. Without proven, automated technology for precise detection and remediation, no network can withstand the daily onslaught of new vulnerabilities that threaten security. 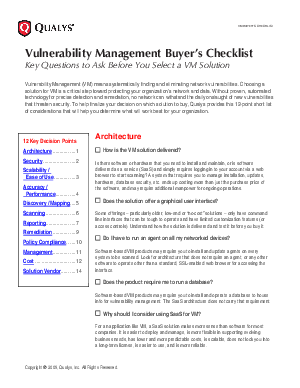 This checklist from Qualys provides a 12 point shortlist of considerations to determine what solutions will work best for your organization.